Proauris calls deafness the fight! 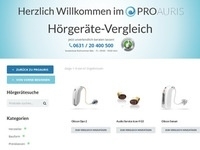 Fill out the participation form on the landing page and test the latest generation of hearing aids free of charge and without obligation - almost invisible, 360 degree hearing and Bluetooth connection. To participate, you must: be at least 18 years old, reside in Germany, have a hearing loss, have no hearing aid, or have one that is over four years old. No bonus portals, no cashback, no incentive, no marketing as a raffle.